A healthy circulation system, including a healthy heart, blood vessels and lungs, is critical for good health. The circulatory system helps ensure nutrients and oxygen are transported to all the cells in your body and waste products are removed from the body. As one ages, or consumes unhealthy food, plaque begins to build inside the arteries from cholesterol, fatty substances, cellular waste, calcium and fibrin. Early detection of a poor circulatory system is ideal. Implementing lifestyle changes such as diet and exercise help. But sometimes more is needed. Cardiovascular issues can be brought on by a number of contributing factors, ranging from family history to physical inactivity to stress. Thus, a variety of treatments may be prescribed to slow down progression. Frequently, what’s prescribed is piecemeal, not comprehensive, and most treatments are accompanied by side effects. Many people look toward a more holistic approach, which includes what’s prescribed, combined with natural alternatives and cleaning living and eating. Enzymes are ubiquitous in nature, and found in every one of our cells. Enzymes are catalysts to begin a chemical reaction or cause it to speed up. About 3,000 enzymes have been identified in the human body. Each works like a lock to a key, and performs a unique function. 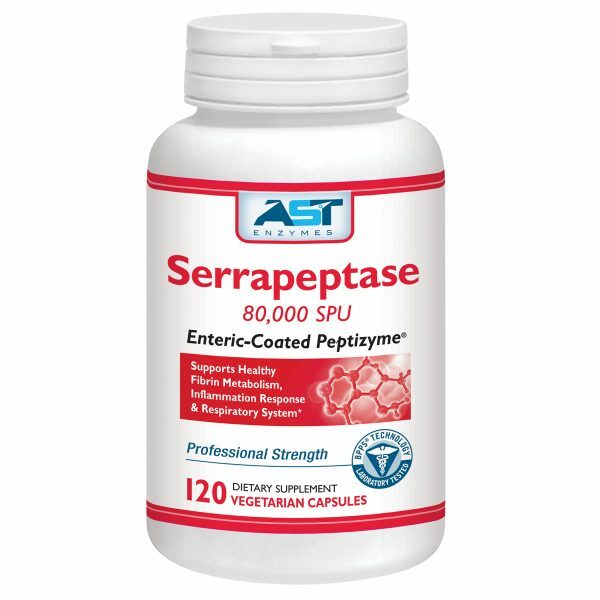 Enzymes are integral in everything from metabolism to breathing to your heart rate. Without enzymes, life would not exist. Digestive enzymes work in the stomach to support digestion, while systemic enzymes work throughout the body to support the body’s many other functions, muscles, joints, nerves, tissues, etc. * As we age, our body’s production of enzymes may slow down, or we may stop producing specific enzymes. 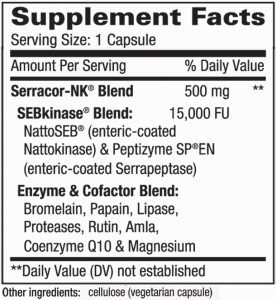 Taking an enzyme supplement supports healthy, normal functioning. 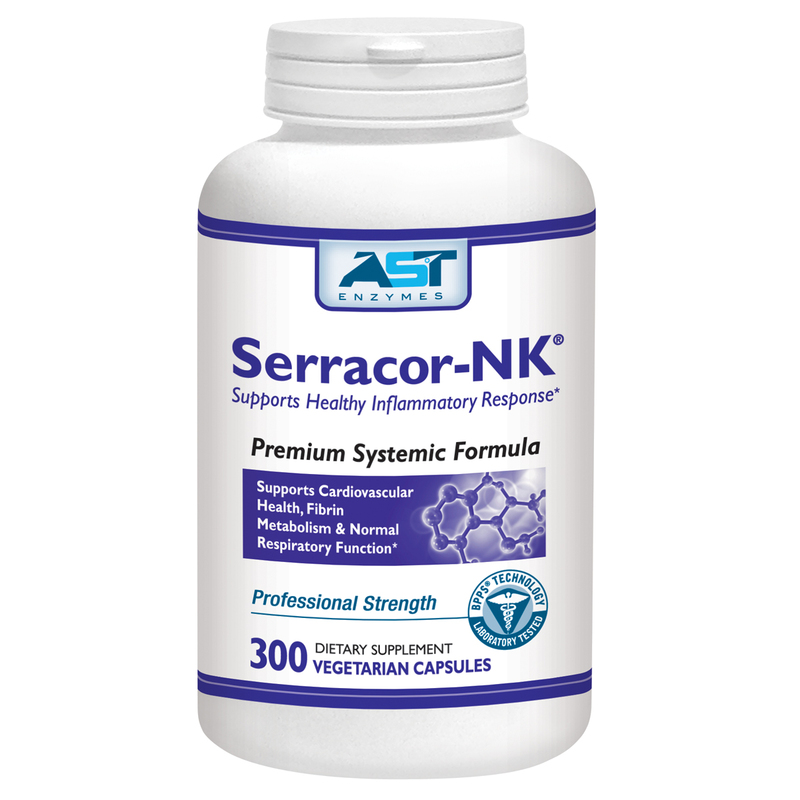 Naturally occurring systemic enzymes provide a non-invasive, natural and effective choice without the negative side effects. Systemic enzymes promote quality of life. Serracor-NK and Serrapeptase 80,000 SPU contain enteric-coated serrapeptase. Enteric coating allows enzymes, which are often sensitive to pH or temperature, bypass the acidic environment of the stomach and survive until they reach the small intestine, where absorption occurs. The efficacy of a systemic enzyme is supported by enteric coating. 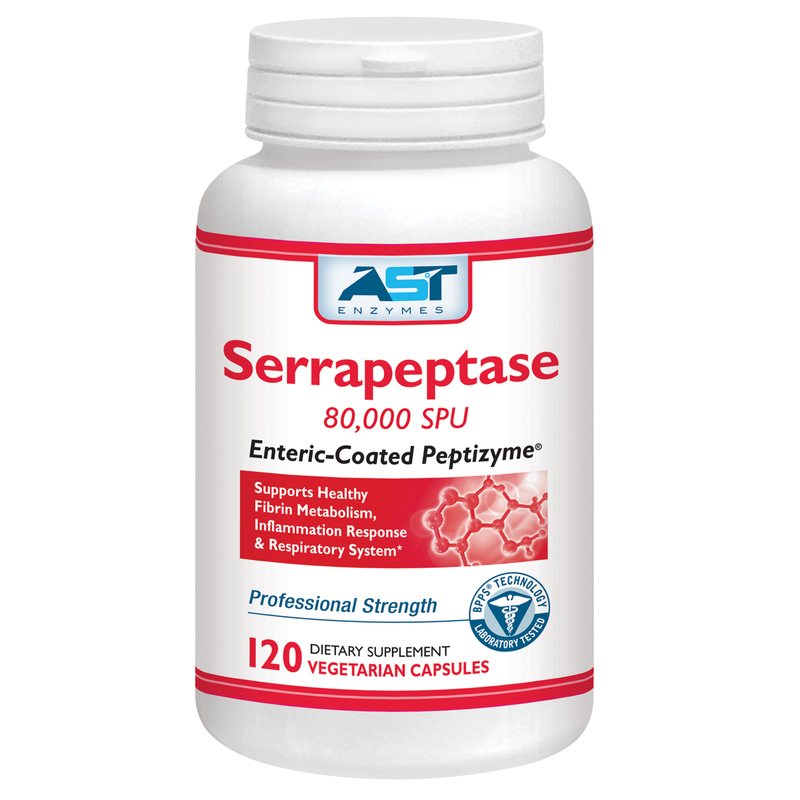 AST Enzymes’ enteric-coated serrapeptase has been formulated with the use of Methacrylic Acid Copolymer (MAAC), a safe food-grade compound used in the pharmaceutical industry with no reported side effects. 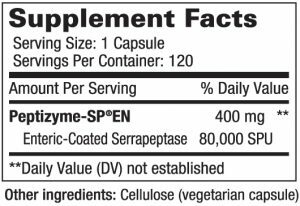 Without enteric coating, systemic enzymes can denature in the stomach, and then simply serve as a very expensive digestive enzyme. Our enzymes are manufactured in ISO 9001:2000 and GMP-certified facilities, and undergo rigorous quality testing. Day 12+: Take 3 capsules, 3 times a day (if needed). Otherwise, continue with two capsules, three times a day. Maintenance Dose: Minimum dosage, and may vary by individual. Monitor closely. 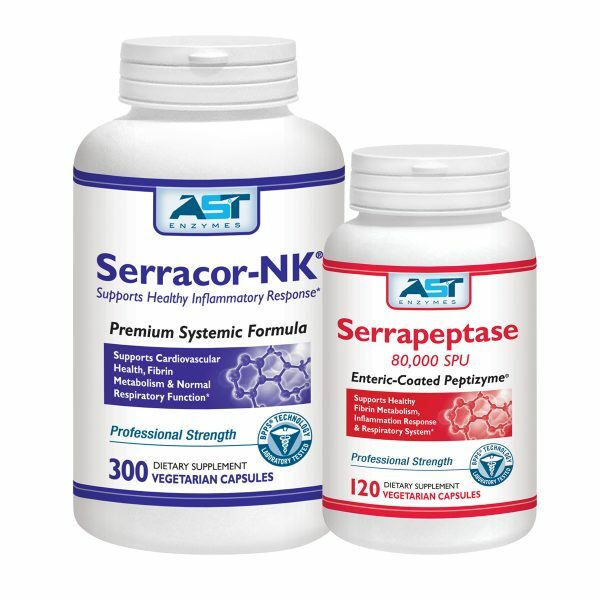 Directions: Add Serrapeptase to your Serracor-NK regimen. Take on an empty stomach (30-60 minutes before or 2 hours after meals). Day 6-11: Take 1 capsule, twice a day. Day 12+: 2(+) capsules, twice a day (if needed). Otherwise, continue with 1 capsule, twice a day. Therapeutic Dose: Maximum amount. Varies by individual. Monitor closely. Maintenance Dose: Minimum dosage. Varies by individual. Monitor closely. Caution If you are pregnant, nursing, taking any medication or under medical supervision, consult your doctor before use. Discontinue use and consult your doctor if any adverse reactions occur.